On with the walk. Leaving the road at around 8pm, we quickly parted ways the other group and made our way up the Gentle Annie track for an evening’s climb. Powell Hut was officially closed, due to be demolished and replaced, but Tony had been past it very recently and noticed that construction hadn’t begun. At the point of leaving, we hadn’t fully decided whether to walk all the way to Powell and try our luck, or to stop at Mountain House. Standing near Rocky Lookout at about 8.50pm we glanced up towards Powell in the lowering light, trying to ascertain if it was still there. There was definitely a hut visible, but nothing to clearly tell us if construction crews were present and demolition underway. High Ridge also stood out. It was the highest ridge. In the end, we elected not to risk it. 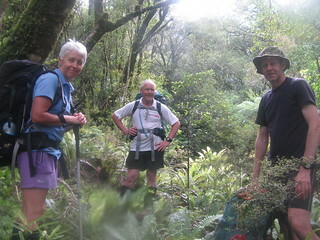 Having passed the track junction for heading to Totara Flats at about 9.40pm. We stopped briefly at Pig Flat, investigating a small clearing leading away from the track, but rapidly retreated backwards when the density of flies and other insects became obvious, all attracted to our head torches. Heather chose to set up a tent. Tony and Peter and I found some mattresses and set ourselves up in the shelter. 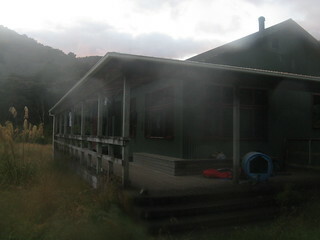 The four of us arrived at Mountain House at 10pm by torchlight and with light drizzle. It rained overnight, and continued in the morning. No worries as the sun was due to come out soon. With morning I dedicated some time to figuring out the camera issue. With some juggling I found that one of my pairs of flat batteries worked okay in my GPS, and the GPS spare batteries worked better in the camera. That might suffice and allow me to take a few photos, for as limited as the camera would be in the rain. Electronics was more of an inconvenience than anything else. I primarily use a GPS to record a track, and a failed GPS would only annoy me for losing that record. We were all relatively competent navigators and I was fairly sure we had at least two other dedicated GPS devices alongside maid and compasses, not counting everyone’s smartphones. Breakfasted and packed up, we set out from the shelter at 7.40am, firstly heading towards Powell. It was at this point that I noticed my map case was leaking, which wasn’t a good fit with an A4 page I’d printed out a couple of nights before that showed our entire trip. The paper was already soggy and the toner running. Grrrr. I stopped and did some rearranging to replace it with my backup and somewhat more water tolerant LINZ-printed maps. 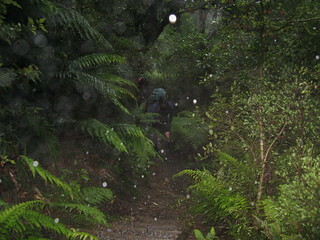 An hour after leaving, we learned that not aiming for Powell Hut had been a good idea. 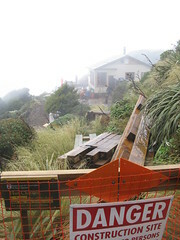 Shortly before reaching it, a fence was in place advising that a work-site was ahead, and that we were required to follow an alternative track. The alternative track gave an impression that we might have been the first people to walk it in the rain. With its slipperiness I didn’t fancy having to follow us. This was a slight complication for Tony. He’d hoped to at least be able to get water from Powell Hut, and yet we weren’t allowed in. We followed the temporary track to its far end, which was within easy sight of the hut itself and allowed us to wave to the workers. Powell Hut was in the midst of a structured deconstruction. The balcony was already gone, and from here there was still no access to the water tank. Helpfully, however, plenty of water was by-now running down the track. Tony filled his water bottle. We left Powell at 9am and continued upwards into the murky and drizzly cloud, reaching the High Ridge junction 20 minutes later. 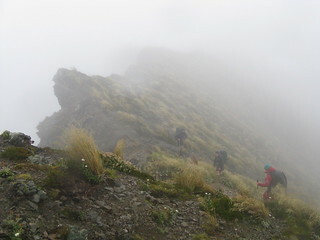 Checking the maps, we took a bearing into the cloud and carefully followed it down the ridge. High Ridge at this time of year, and this time of day, and this type of weather, is decorated with lots of tussocky landscape, flowering flaxes and flowering speargrass. We continued for some distance, finding a route through am occasionally boggy ridge, taking care not to venture too close to the edge of a significant slip. Tony collected someone’s old jandal along the way. It’s not intuitively clear as to exactly where to enter the trees. I took a guess of a leap into the trees and for a few minutes thought I’d stumbled upon a persistent ground trail, only to have it fire me back out into the tussock some distance away. 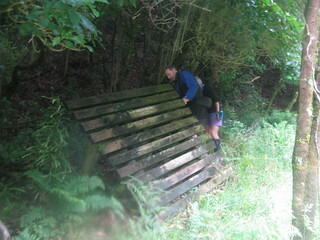 Further along we discovered another entry point which proved to work better. After a few minutes of scrambling around low branches, from about 10am, we were walking more easily between the goblin for that dominates this part of High Ridge. The rain continued, but surely it’d be clear and sunny by midday. We circumnavigated a handful of tight and clambery bits, and perhaps one of the marked a place where I’d fallen 12 years earlier having misjudged the ability of a branch to take my weight, but this time none of them presented similar issues. 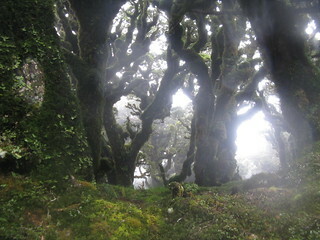 Around 2.5 hours after entering the trees, and 350 metres below the turnoff, the four of us stood on Flaxy Knob. The clock was approaching 1pm and we sat for an informal lunch. The rain continued. Flaxy Knob includes a sign pointing at Totara Flats, but it’s still not very clear. Taking an initial bearing south-west, we left Flaxy Knob at 1pm and soon picked up an approximate ground-trail with occasional old forest service markers. 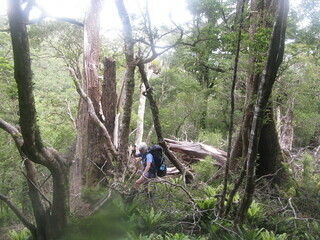 At one point, nearing the river at the base, we caught a glimpse of Totara Flats Hut. It was about here that I realised my GPS battery was flat, and I’d annoyingly missed a big chunk of our route down High Ridge. How annoying. I juggled more batteries and discovered that I could get more time from my camera batteries, and the camera would continue to work on some other batteries I’d thought were flat. At 4.15pm we pushed through a brief amount of supplejack on the flat and walked out to the cairn marking the base of the track, arriving at Totara Flats Hut by 4.30pm. 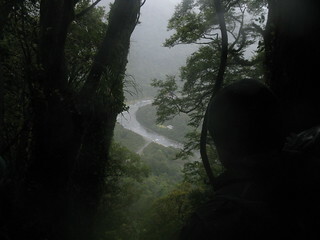 We weren’t the first to arrive at Totara Flats, with several duos had walked in from the Waiohine Gorge entrance, and soon after we arrived a chap stopped by during a valley SK attempt. At one point we’d considered looking for campsites on the flats but by now, and with the ongoing rain, we were quite happy just to settle in and exchange chatter with some of the other visitors. Peter, Heather and Tony found space inside, and I carved out some space with my mattress and bivy bag on the balcony, next to one of the empty dog boxes. Dinner was a tasty couscous based meal (thanks for planning, Pete). At some point the rain had slowed down, now that we were no longer outdoors, and eventually as the sky darkened I retired outside to my bivy bag. I lay there listening to the night time sounds and glancing at the few stars that I could see when bending my neck enough to glance beyond the veranda. An occasional crack of noise of unclear origin from came from somewhere behind the dog box. I opened my eyes to see a mouse running away from me across the balcony, pulling a train behind it with all my things on it. Hey Give That Back! Then I fell asleep. Somehow everything appeared normal as the earth rotated for its horizon to be below the sun again. Someone had some water boiling inside and, after breakfast, I emptied my pack and began the process of re-packing. Heather, who’d taken some fascination with my map case that I’d not been able to close properly since I learned it was leaking the previous morning, made a mission of trying to get it sealed… she triumphantly declared it achieved after about 15 minutes. 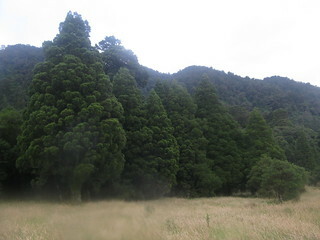 The view from the old Totara Flats Hut. Rather than walk straight out of Totara Flats on Sunday, we adapted our plans slightly. 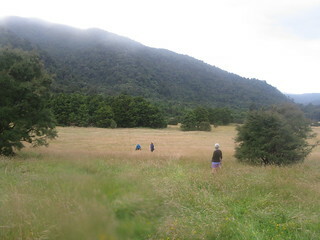 First we’d head over to Totara Flats and locate the old hut site. 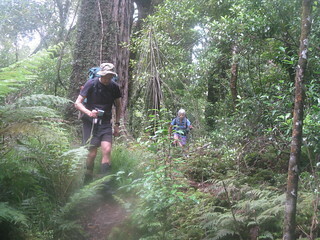 Then, rather than walk out directly via the current main track, we’d follow the old track alongside Totara Creek and attempt to navigate up to Mountain House. We left most of our stuff in the hut prior to leaving towards the flats shortly after 8am, knowing that we’d be back soon. We finally had a day without rain. The flats are just a short walk away and within a casual 30 minutes we had located the old hut site. It seems to have even fewer remains now than what I think I recall from a decade ago, but part of an old balcony remains buried in the trees. There must have had a wonderful view across the flats, but I can appreciate where the concern of flood risk would have come from, which was the reason for replacing it. It’s some way above the nearby creek which flows into the Waiohine River, but with the surrounding topography I could imagine that an especially heavy rain event might result in water diverging down the hillside and spreading across the flats in some way. Besides the hut site, the flats are packed with good camping. Before returning to the hut we poked our noses into several great campsites, both in the trees near the old hut site and at various places in the trees above the Waiohine River. We waved to other parties, with whom we’d spent a night at the hut, as they sporadically made their way past is in the distance, mostly heading back towards Waiohine Gorge. Finally, about an hour after we’d left, that morning, we arrived back at Totara Flats Hut to collect our thinks and continue on our way. 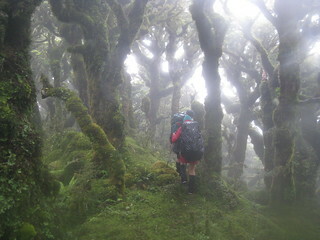 We left Totara Flats Hut, a second time, at 9.25am. There’s now a largely wet weather track available back to Holdsworth, since a bridge was built over Totara Creek, and then rebuilt after party of its foundations washed away. We crossed several side creeks and reached the bridge after 20 minutes. In keeping with our earlier decision, however, and taking into account the improving weather, stuck to the old track on the true right of Totara Creek rather than cross the bridge. 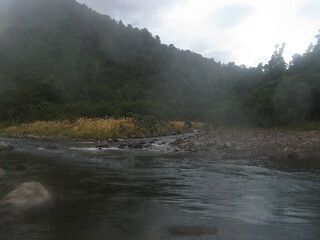 It largely follows the river, but in doing so it undulates up and down from time to time as it sidles the valley. I was developing a headache but managed to find some paracetamol during a short stop, and whether through genuine change or a placebo effect, I gradually began to feel better. This route took us roughly two kilometres to where the old track crossed Totara Creek, pushed up the hill and joined the existing track. Instead of doing this, however, we initiated Pete’s idea and located the base of the spur below Mountain House. 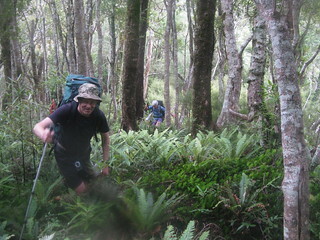 From here we guessed at a bearing and at about 11.40am we began a climb through a thick carpet of crown ferns. Within the Tararua I’m used to nearly every route having at least an occasional informal marker, and so I found it surprising that this route appeared to have none at all, and had no discernible ground trail, even though it seemed to be a route that must be followed from time to time… because why wouldn’t you? Nevertheless we didn’t need markers as we always knew roughly where we were and where we were going. There were a couple of points of confusion. A slight point of ambiguity where it might be possible to climb either to Pig Flat or to a point just above Mountain House. Tony figured that part out. Another point of confusion occurred between my old Topo50 map and the newer Topo50 map which several others had. For some reason, on this spur of relative insignificance, LINZ has decided to extend the blue line representing one of the creeks. Consequently others in the group were describing our movements relative to the river, and some of those descriptions made little sense to me until we figured out the discrepancy. Heather navigates through a tree. 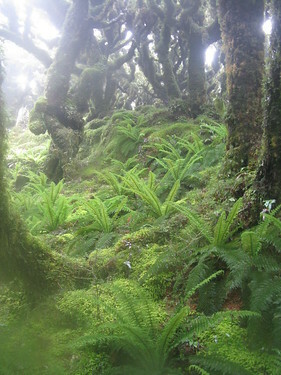 After an occasional correction we approached the top of the spur, via a large and inconvenient fallen tree, noting that the place where we were emerging – maybe a couple of hundred metres above Mountain House – was increasingly steep. We managed it, though, and abruptly popped into the track, before 2pm, where we proceeded to sit. At this time Heather, who’d driven her own car to reach here, decided she’d like to get home, and so we said or goodbyes and she left us to hoof her way down the track. 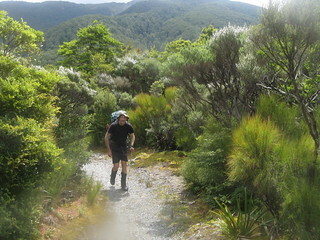 Tony and Pete and I spread out but returned in a somewhat more relaxed fashion, crossing Pig Flat with its flowering flax in wonderful sunlight. We arrived back at Holdsworth Road 1.5 hours later, about 3.30pm and only 2 minutes after my GPS went flat again, content at having enjoyed a worthwhile weekend in the Tararua. Since then, I must thank Heather for providing a chunk of the GPS data that tracked us down High Ridge. It’s helped me to fill a gap in our trip, and probably one of the more navigationally interesting stretches. 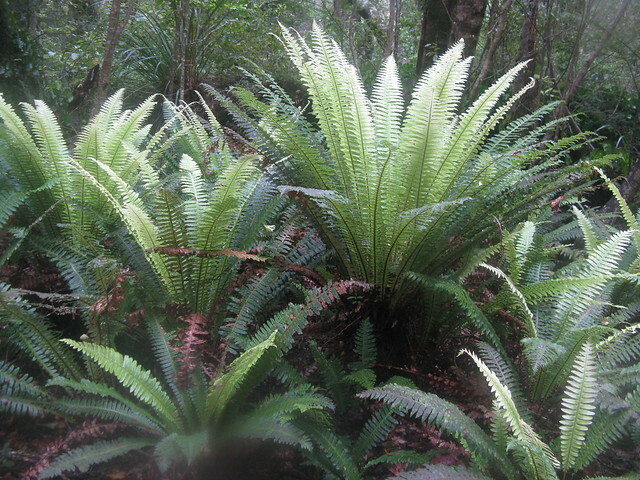 This entry was posted in tramping and tagged bagged:holdsworth lodge, bagged:mountain house, bagged:powell hut, bagged:totara flats hut, navigation, tararuas, wellington tramping and mountaineering club. Bookmark the permalink.